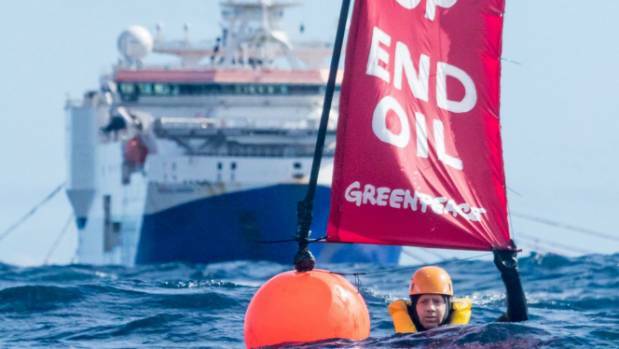 Dr Russel Norman, ex-MP, will be tried for interfering with the operation of the Amazon Warrior in an oil exploration protest off the east coast of the North Island. Judge Nevin Dawson set the trial date for April next year. Serves Norman right, of course, after Dawson J last June offered diversion to the three defendants and they refused it. Tough. We obviously inhabit a strange legal netherworld, for the Herald can publish front-page photographic proof of Norman’s crime (below), yet the judge apparently finds his denial credible and, instead of sentencing, remands him for trial. Queer. “Why did you jump into the sea in front of the large ship, Mr Norman?” asked the judge. Companies don’t “burn the oil”, their customers do — including Greenpeace when travelling to the crime scene. What evidence does Greenpeace have to support runaway climate change? It must be none at all, for they would have told us about it by now. These are criminal frauds taking subscriptions from the public under false pretences. EVEN THE IPCC DO NOT PREDICT RUNAWAY CLIMATE CHANGE. The notion is absurd, illogical, unreasonable, empty of rational thought and unsupported by a speck of evidence. It has not happened in the history of the earth because it cannot happen. Every “expert” they bring in “from around the world” will testify against the IPCC. They must, for the IPCC don’t support the idea. More importantly, the IPCC do not recommend policy (such as the renouncing of productive, reliable and freely available fossil fuels), because it’s engraved in stone in their founding document that they will not. Now, since Norman’s arguments about the greater good have failed to quash the charges, they will also fail to prevent conviction and real punishment. Tough. Russel ‘Give me back my flag’ Norman motoring around in a big Greenpeace launch burning fossil fuels in the name of protesting fossil fuels reminds me of Dennis N Horne’s hypocrisy of flying planes as a hobby when he’s not lecturing on the harm of fossil fuels. Not to mention Al Gore, Leonardo di Caprio, Richard Branson, Elon Musk, & Bill Gates, who all own private jets, Harrison Ford (owns 7 planes), or Hillary Clinton who took a private jet just 20 miles from Martha’s Vineyard to Nantucket for a fundraiser, & former President Barack Obama who has taken more than his fair share of private jets and helicopters since leaving the White House. How many poor, innocent, cuddly polar bear cubs will die a slow & horrific death of starvation as a result of Russel Norman’s evil fossil fueled publicity stunt. Nobody pays attention to a hypocrite. 10 years of NIWA research shows that Law of Partial Pressures still works 65 km off the Otago Coast. Absorbed CO2 at ocean surface follows level of CO2 in the atmosphere – but more research is required. This man is only in it for the publicity it brings. A typical showman’s approach. He is shameless. I did this little animation for a local blog at the time. This man is quite shameless and is only in this for the publicity – a common ploy by such folk these days. I did this animation at the time for a local blog.